These are titles of sections though, as such, title casing applies. That's a part of the English language/grammar. (Edit conflict) Maybe in newspaper headlines, but not in scientific papers, which is the model most wikis use for their overall style. Check Wikipedia. I personally prefer titles to use title case, including page titles and section titles. However, like a lot of grammar, it comes down to consistency -- there isn't a uniform rule about what constitutes a title, never mind when to use title case. Most news organizations and book publishers use title case for anything that isn't body text. A lot of wikis use sentence case. As much as I think sentence case looks bad, there are many in the community who think the same about using title case. Oi, stop making update note pages without update notes on them. A build number is not why people go to look at update notes, they go there to see what was updated. Posting a page without that information just wastes peoples time, causes frustration, and it just looks like you are attempting to show off your e-peen. Which makes you look stupid. —The preceding unsigned comment was added by 217.44.42.159 (talk • contribs) at 22:53, 26 July 2013 (UTC). I'll echo what I said before: "That's nice? It's also irrelevant. Not every patch has notes. This is not the first time it has been documented under the patch section (I.e. not Guild Wars 2 Wiki Notes) that no notes were made available. Please do proper research before attempting to criticize me on a practice that has occurred in the past on the wiki. Thank you." Maybe this will clarify. Placeholder text is acceptable. Read the above. "The text indicating no post isn't a note, it's placeholder text. We don't want to leave the patch notes section blank because that may indicate that the notes haven't been added yet or post is empty (possibly).--Relyk ~ talk < 03:24, 26 June 2015 (UTC)"
Seems quite clear to me. Quoting the entire official announcement is unnecessary clutter. Stating via the notes that it's F2P and having a link to the official announcement page is the correct thing to do, and it also allows players to visit the Guild Wars 2 website and read more about it and the game. This in turn can potentially generate new player base and revenue for ArenaNet. I'm sorry you don't want to help the community and ArenaNet in getting new players and increase their revenue. There are no patch notes found here. Quoting the entire official announcement is unnecessary clutter. Stating via the notes that it's F2P and having a link to the official announcement page is the correct thing to do, and it also allows players to visit the Guild Wars 2 website and read more about it and the game. This in turn can potentially generate new player base and revenue for ArenaNet. Please take another look at my screenshot of the forum post. It is clearly displaying the time in GMT, which matches my location in the UK. You, I'm guessing, are somewhere on the west coast of America (correct me if I'm wrong), so it's showing PST for you. The forum automatically changes the displayed timezone of the stamp to match the location of the user. Change your computer's timezone settings and take another look at the forum post if you don't believe me. Further, as you noted and as both of our screenshots prove, the hover text always displays the UTC time regardless of the user's timezone. To me, this indicates that the forum defaults to UTC. The only issue I have with checking the timing of previous posts is that the wiki post is not correspondent exactly to forum post, and the forum doesn't seem to have an exact "time posted" attribute, just "X days ago". So if there is a way to check this, then I'd be up for whatever habit we've been in. If there isn't a concrete way of doing this, then I think a new/separate conversation is needed, which would be According to what time/timezone do we post patch dates. As for the change time, I'm aware it's possible, but all I can say is that I have not changed things from standard utc (I virtually never use the forum, only to talk about API stuff). Finally, Tarun. Thank you. I assume you didn't intend it to be so, but bringing up forum timestamps to support your argument in favour of PST was incredibly misleading. Why did you think that posting a screenshot of the forum post would make it clear what the time had been for ArenaNet, when you never bothered to mention what timezone was being displayed in the screenshot? 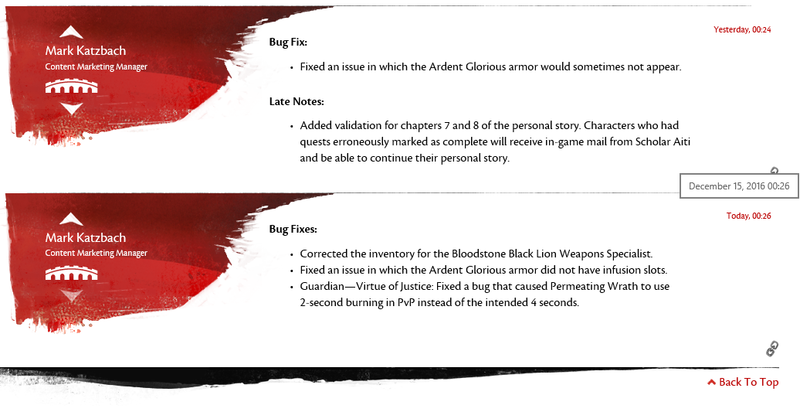 If you had avoided screenshots and timestamps altogether and simply said "ArenaNet is PST, PST is UTC-8, therefore from ArenaNet's perspective the patch was unambiguously pushed on the 14th" then we could have avoided a lot of this nonsense.